In the air, Tyler Huntley’s pass looked perfect. Utah receiver Derrick Vickers ran down the sideline as the ball arrived, and here came safety Julian Blackmon, moving in front of him to make the interception during the Utes’ first session of spring football practice Monday. That's the kind of play the Utes hope Blackmon will make frequently in his new position, having moved from cornerback. Defensive coordinator Morgan Scalley believes the switch can do as much for Blackmon and the defense as Chase Hansen's move from safety to linebacker helped himself and the team last season. “Julian's just got great range and great ball skills,” Scalley said. Blackmon’s coverage as a cornerback was inconsistent last season, although the nature of that position is such that the mistakes are easier to remember. He allowed Washington State’s winning, 89-yard touchdown catch (safety Corrion Ballard failed to make the tackle) and was beaten on other long passes down the sideline. Blackmon also did enough to earn an All-Pac-12 second-team selection, such as returning an interception for a touchdown against BYU. In any case, if observers suggested he was not ready for the NFL, Blackmon agreed. He chose to stay in school for his senior season, a decision that defensive linemen Bradlee Anae and Leki Fotu and running back Zack Moss also made. (Trent Nelson | The Salt Lake Tribune) University of Utah defensive back Julian Blackmon makes an interception at the first day of spring football practice in Salt Lake City on Monday March 4, 2019. Showing his versatility by playing safety should improve his credentials. That was part of Scalley’s pitch in persuading Blackmon to make the move, although not much convincing was required. 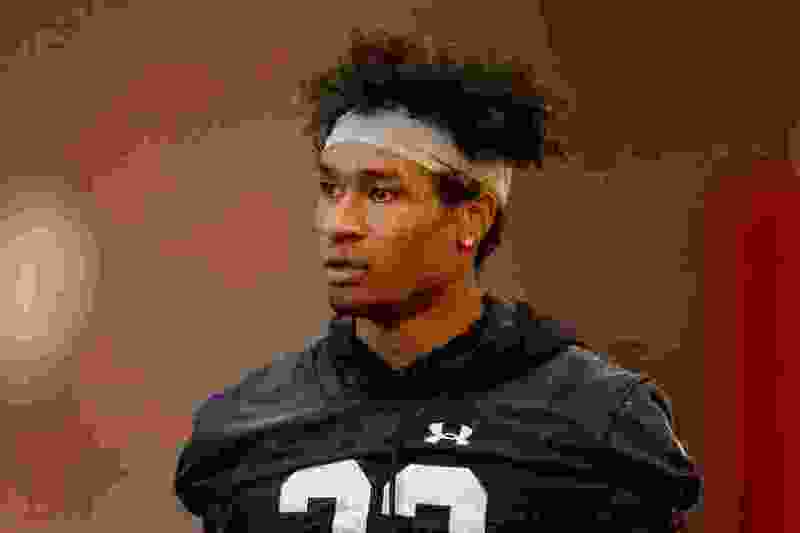 Blackmon actually came to the staff with the idea, recognizing that Ballard and NFL prospect Marquise Blair were leaving vacancies at safety and the likes of Tareke Lewis and Josh Nurse were emerging at cornerback, on the side of the field across from All-Pac-12 player Jaylon Johnson. The plan is “get our best 11 players on the field,” Blackmon said. The related goal is intercepting more passes in the secondary. The Utes ranked third in the Pac-12 with 15 interceptions last season, but those were oddly distributed. Linebackers accounted for four pickoffs and defensive tackles had two. Blair and Ballard added three between them at safety, while Johnson made four of the six interceptions by cornerbacks/nickel backs. Johnson logically will have fewer opportunities in 2019, as opposing quarterbacks work around him. Blackmon should have plenty of chances. Utah's defensive scheme often will use strong safety Terrell Burgess in the box for run support, leaving Blackmon as a single deep safety, roaming the secondary. • A Utah native who helped Layton High School win the 2015 Class 5A state basketball championship with his brother Jarriesse, now a UC Santa Barbara basketball player. • Two-time selection to the All-Pac 12 second team as a cornerback. • Named the MVP of the 2017 Heart of Dallas Bowl with two interceptions vs. West Virginia. • Has made 26 career starts, with five interceptions. • Ranked fifth in the Pac-12 with 10 pass breakups in 2018. “With me being able to see the quarterback now, I can react, rather than just guard a guy,” he said. It's a much different job description than cornerback, with responsibilities against the run and pass coverage across the entire field, not just one side. Blackmon’s interception in Monday’s practice came after he called a switch with a cornerback and ended up covering Vickers down the sideline. As the ball arrived, Blackmon adjusted and made the play. As a cornerback, he allowed some completions on similar routes last season. From his new angle, the result was completely different.